If you attended the FACE conference in Glasgow then you will know just how high the calibre was of the individual paper presentations. Listing them all and their virtues would likely stretch on for a whole season’s worth of e-bulletins! It’s simply a case of ‘you had to be there’! Instead, I’d like to focus my reflections on the keynote speakers and student performers, all of whom took me by surprise, for different reasons. In this section, I’ll focus on the keynotes and in the next section, the students. Any regular conference goer would probably concur that keynote speaking is a bit of an art. Be engaging. Know your stuff. Let your personality shine. Be funny (but not too funny). Offer insights. Challenge. That last one is the trickiest. Keynote speakers deliver their talks to audiences that are themselves experts in their fields, so to challenge them is no easy feat. That’s where I think the keynotes at FACE 2017 really excelled! Shirley-Anne Sommerville MSP evoked the huge task Scotland has in widening participation to higher education, both in numbers (1.1% recent increase in participation from the mose deprived areas) and in tensions between Westminster and the Scottish government when it comes to policies–the Teaching Excellence Framework being a great example as it is not required in Scotland. 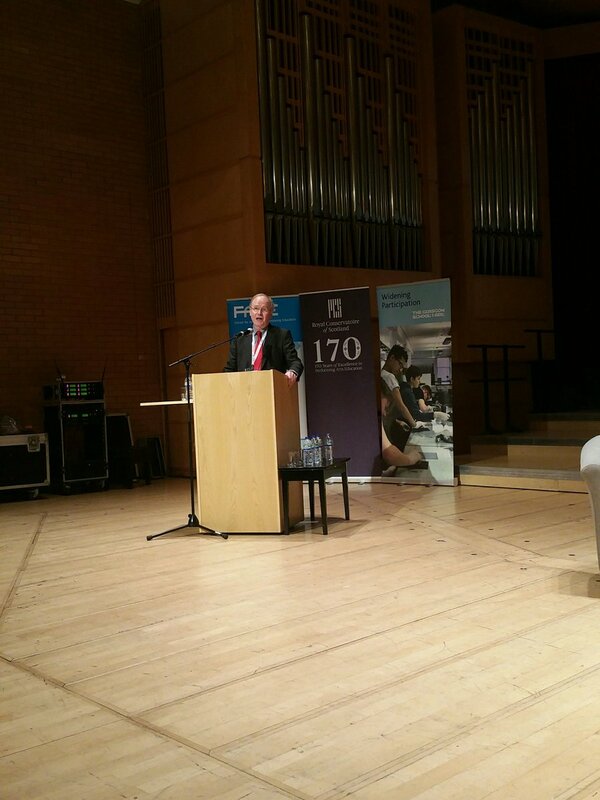 Sir Peter Scott, recently appointed Commissioner for Access to Higher Education in Scotland, delivered a powerful speech, challenging a sector that has become obsessed with market forces, rankings and a desire to copycat elite institutions. He pinpointed that at the root of such deviations is the rise of the white middle-class and levels of inequality unseen since World War 1, both of which contrive to systematically lock the less advantaged out of higher education. His response? Do not be “spooked” by populism. Do not buy into the “world-class mantra” or the “performance culture”. Rededicate yourself to access and share your research…engage with the world around you. 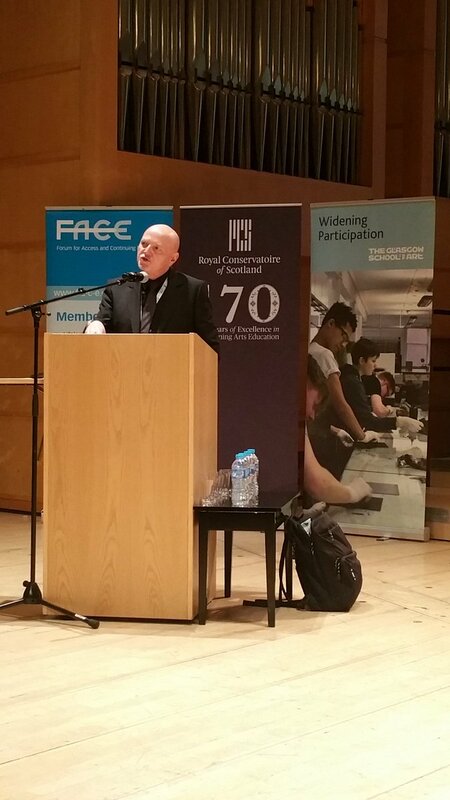 Alan Sherry, Principal at Glasgow Kelvin College, discussed important widening participation policy failures. He challenged the importance of the graduate premium (i.e. the difference university graduates make compared to non-graduates) and blanket-type participation policies that ignore subleties in access to further and higher education. Alan also spoke eloquently on the very real threats of near future labour market changes and the lack of smart widening participation policies being deleveloped in parallel. 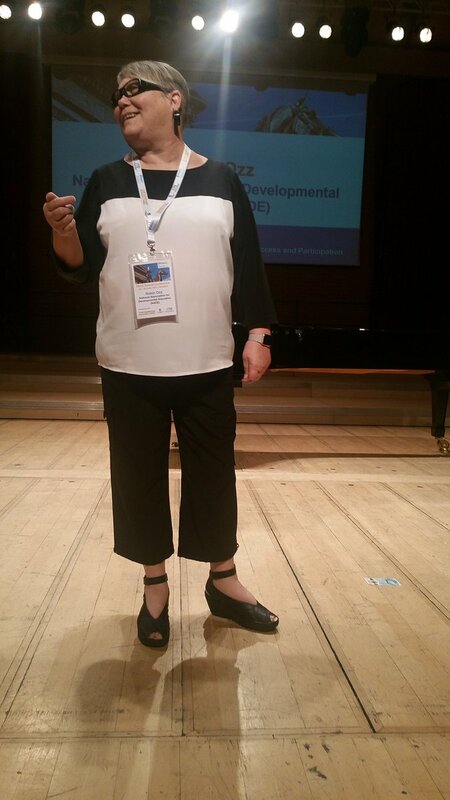 Robin Ozz, President of the National Association for Developmental Research (FACE’s sister organisation in the USA), captured delegates’ attention with her deconstruction of the neoliberalist education system in America. She also showcased a powerful analogy of access to education: using members in the first few rows she demonstrated how our education system is rigged for those closest to and with the easiest path to higher education. A great example of how to be funny, yet sobering! Finally, Vonnie Sandlan, outgoing President of NUS Scotland, honoured us by using her final day as President to provoke us into looking closely at the perceived success of widening participation policy in Scotland. 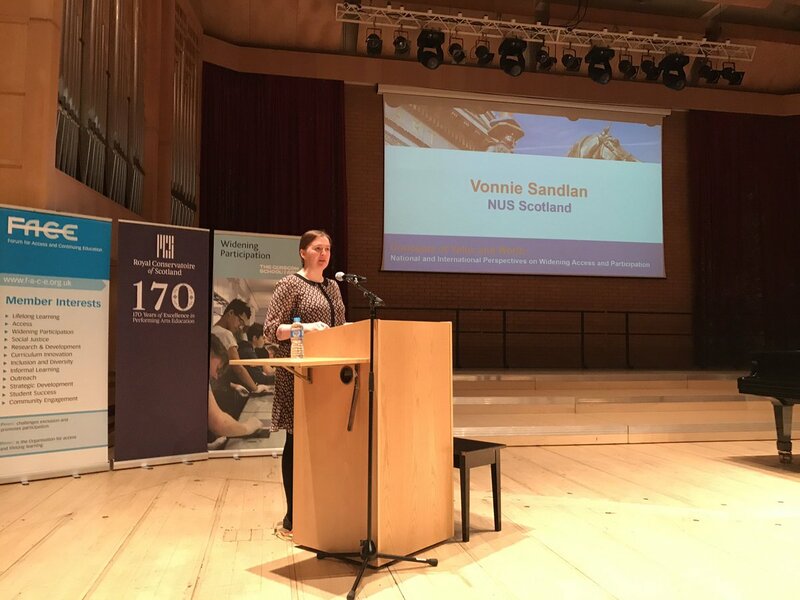 With the most deprived areas of Scotland still lagging far behind in participation, Vonnie did not mince her words: “at our current pace we’re set to miss our target by decades”. With Scotland having the worst retention rate across Europe, she left us with a real policy dilemma: “is widening access enough?”. Vonnie is now a Senior Policy Officer at Colleges Scotland–best of luck in your new role! 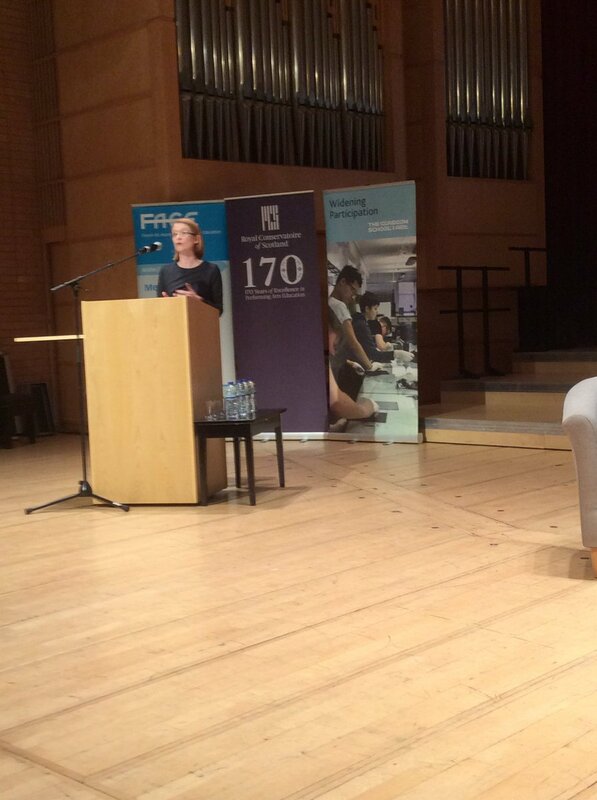 I hope this has given those who could not attend the conference a glimpse into how engaging and thought-provoking our keynote speakers were, while reminding those who did attend to keep asking tough questions!